MRC Construction - Builder based in Bishops Tachbrook, Warwickshire . 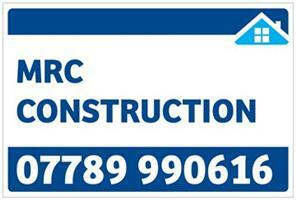 MRC Construction is a small building business in Leamington Spa, run by myself, Mark Rowland. I have been in the building trade for over 12 years and worked with another business for best part of that. I set up properly on my own 2 years ago as I have a young family and wanted the opportunity to build my own business. I have worked in all aspects of building from patios to full extensions to doing drainage and turfing gardens! I wanted to go on Checkatrade so customers could see I'm fully vetted, insured and could see what my customers think of my work. There are a lot of other builders out there willing to do a rubbish job and charge over the odds for what they have done. That's why I decided to go on Checkatrade as customers can have confidence in who they are dealing with. Even in the short time I have been on my own all of my work has come from referrals and recommendations. MRC Construction pride ourselves on providing a friendly, reliable and top quality service in all the work we do.